Open an account with Google Analytics (it's free). Copy your tracking code from your Google Analytics account. Login to your website, click on Tools and click on the Setup Google Analytics link. Your done! 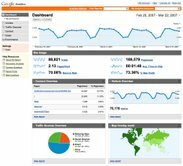 Your website starts immediately sending traffic data to Google Analytics, and you are able to track your website activity using Google Analytics impressive set of tools and clean interface.